Back of Beyond Baking: Cake Confusion! My parents are quite elderly and both have developed a hearing loss due to their advancing years. My dad refuses to wear his hearing aid, saying it makes everything too loud. My mum has a hearing aid but it seems to be broken more often than it works. Living out in the back of beyond means that I have to keep in touch with them by telephone and as you can imagine their hearing loss can make for interesting telephone conversations. Mr V-C can often be heard laughing hysterically as I try to make one or other of my parents understand what I am asking them. Recently I called them and asked if they liked fruit cake and would they like me to send some fruitcake for them when Mr V-C was next in the area. Dad said "Yes, we love fruitcake". So dutifully I made them some fruit cake and sent it with Mr V-C who delivered the parcel which was apparently gratefully received. A couple of days later when speaking to my mum I asked if she had enjoyed the fruit cake she replied "Your dad's been eating it but I'm not that keen on fruit cake". I was a bit surprised by her response. I reminded her that I had asked if they liked fruitcake and they had responded favourably. "Oh" she said "Dad said you were sending cheesecake and we like cheesecake. I was a bit confused when we got the fruitcake!" So of course I now felt guilty and had to make cheesecake. 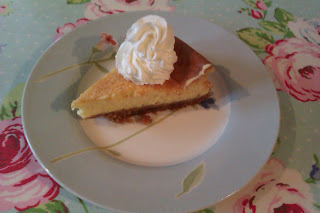 I made them a baked Vanilla and lemon cheesecake and delivered it on Easter monday. I gave it to dad who said "ooh, we can have that after our tea". I replied saying it was half a big cheesecake that would probably last 3 days or more". "Righto" says dad. Today I phone mum and say did you enjoy the cheesecake "Yes" she says "I had a piece yesterday as your dad said you said we couldn't eat it for 3 days!!" AAARRRGGGGHHH! All I can do now is hope it hasn't gone off whilst dad has been dutifully waiting 3 days before eating it!!! Mix the crushed digestives and melted butter together and tip into the base of your cake tin. Press down firmly across the bottom of the tin to form a base. Beat the mascarpone and sugar in a free standing mixer with a paddle attatchment until mixture is thick and creamy. Pour in the cream whilst the beater is on a slow speed mix well. Add the lemon juice and zest and vanilla extract. mix on a slow speed until just combined. Pour the mixture on top of the crumbs and place in the oven for 1 hour 15 minutes. The cake is done when the cake is risen, the centre should be wobbly but not runny and the edges of the cake will have started to pucker. Turn the oven off but leave the cake in the oven for 15 minutes. Remove from the oven and leave in a cool place until the cake has sunk slightly and thoroughly cool. Place in the fridge over night before eating. I sometimes top this cake with fresh strawberries or raspberries which always goes down well. For a gluten free version just replace the regular digestive biscuits for gluten free digestives. I have even made it with gluten free ginger biscuits for the base. LOL @ your parents!! There's a whole book of anecdotes there I'm sure! !